The annualized rate of wage growth over the last quarter was just 2.5 percent. 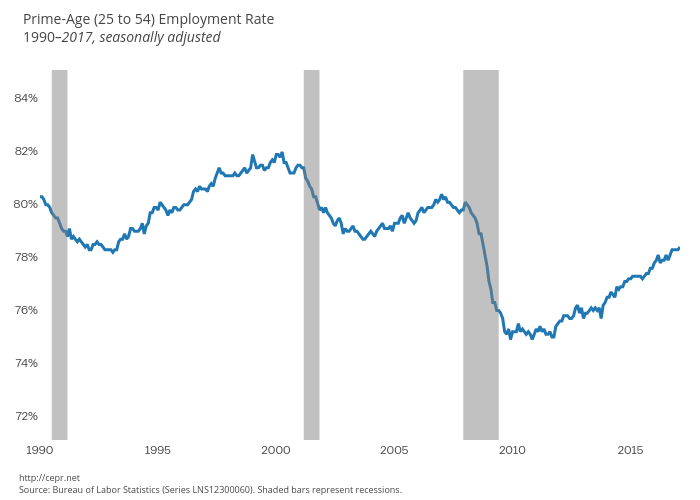 The employment-to-population ratio (EPOP) rate for prime-age workers (ages 25-54) inched up to 78.3 percent in February, a new high for the recovery, as the economy added 235,000 jobs in the month. The unemployment rate was little changed at 4.7 percent. The EPOP for prime-age workers is 0.5 percentage points above its year-ago level. Most of the rise has been among women, with an increase in the prime-age EPOP of 0.8 percentage points to 71.6 percent over the last year. The rise among men over this period has been just 0.2 percentage points. The EPOP for women is 1.3 percentage points below its pre-recession peak, while the EPOP for men is 2.7 percentage points below the pre-recession peak. Compared to the 2000 peak, women’s EPOP is down by more than 3.0 percentage points and men’s by more than 4.0 percentage points. The rise in EPOPs over the last year is noteworthy since it suggests that there are more workers being pulled into the labor force as the recovery continues, even as the unemployment rate has remained relatively stable. If this trend continues, it indicates that the labor market can continue to tighten without creating inflationary pressure. The percentage of workers who are unemployed because they voluntarily quit their jobs fell for the third consecutive month. At 10.7 percent of the unemployed, this key measure of workers' confidence in their job prospects is closer to recession levels than full employment. Wage growth also appears to be slowing somewhat. Year-over-year growth in the average hourly wage was 2.8 percent in February, but if we compare the average of the last three months (December-February) with the prior three months (September-November) the annualized rate of wage growth was just 2.5 percent. This does not support the view that wage growth is accelerating. It is also important to remember that employers are shifting compensation from health care to wages, so wage growth is likely exceeding the rate of growth of labor compensation. It is interesting to note that there is not an obvious bias towards more educated workers in recent employment patterns. The EPOP for workers with a college degree is actually down by 0.3 percentage points over the last year, while the EPOP for workers with just a high school degree is up by 0.4 percentage points. The latter figure is especially striking since the workers now reaching retirement age disproportionately have less education. The areas contributing the most to job growth in February were construction (58,000), educational services (29,300), manufacturing (28,000), and health care (26,800). The construction figure was likely inflated some by unusually mild winter weather in the Northeast and Midwest. The manufacturing gains were broadly based although the erratic food sector accounted for 8,800. The jump in educational services is likely an aberration that will be reversed in future months. Job growth in health care was slightly below the 29,700 average over the last year. Retail lost 26,000 jobs, likely due to cutbacks at a number of major department stores. Restaurant employment rose by 16,700 in February, down somewhat from its 21,300 monthly pace over the last year. If this pattern continues it could mean that workers are moving from relatively low paying and low productivity jobs in retail and restaurants to higher paying, higher productivity jobs in other sectors of the economy as the labor market tightens. On the whole, this is a very positive report. The economy is creating well over 200,000 jobs a month, which is considerably more rapid than the underlying rate of labor force growth. This means that the labor market will tighten further if this pace of job growth continues. Nonetheless, it does not appear as though the labor market is reaching any constraints. Wage growth remains modest and, if anything, may have decelerated slightly in recent months.